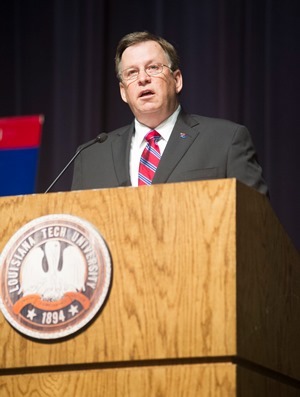 Over the past eight years and as a result of the efforts of our campus community, Louisiana Tech University has made significant impacts and achieved substantial growth in the face of unprecedented financial constraints and operational challenges. These accomplishments have shown what can be accomplished when working together to create opportunities for our students and our state. Despite these achievements and our commitment to building a better tomorrow for all Louisianans, we find ourselves today on the threshold of a budgetary crisis that could cripple higher education in the State of Louisiana and could destroy the momentum and ability of Louisiana Tech to produce the graduates and economic impacts needed to sustain a healthy and progressive workforce. The cuts that are being considered right now would have a crippling impact on nearly every aspect of our campus life and our community. Now more than ever, the alumni and friends of Louisiana Tech must be active advocates for our university. We cannot sit on the sidelines and hope that others will speak loud enough for our institution and the higher education community. I strongly urge you to contact your legislators and community leaders, and tell them that funding for public universities must be preserved if we are to fulfill our obligations to our students, our community and industry partners, and the citizens of our state. We must effectively communicate to them that higher education is a critical part of the solution to Louisiana’s financial challenges, and not a source of the problem. The upcoming special legislative session represents an unequivocal turning point for Louisiana Tech and, quite possibly, one of most important chapters in the higher education story that will be told for generations to come. Make no mistake about it…the budgetary decisions that are made in the next few weeks will affect every region, every community, every business and organization, and every Louisianan. Please stay active and engaged in this fight for Louisiana Tech and higher education. I will keep you updated as best I can and would ask that you encourage others to lend their voices and advocate on behalf of Louisiana Tech and our entire higher education community.